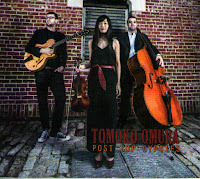 Tomoko Omura (5 string violin); Alex Goodman (guitar); George Delancey (bass). I've always had an affinity with jazz violin, perhaps it was because my first efforts at making music were on a cut price Strad or, more likely, it was when I first heard Stephane Grappelli (or Grappelly as he called himself then). To this day I love the gypsy jazz sound as personified by local exponent Emma Fisk. However, I also love more modern sounds and, somehow, Jean-Luc Ponty never quite cut it for me. 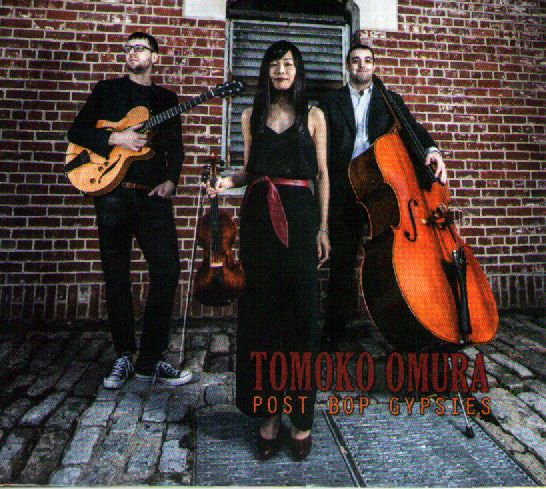 Enter Tomoko Omura, Berklee graduate, the first violinist to receive the prestigious Roy Haynes Award and, now, with two previous albums to her name, this latest release. 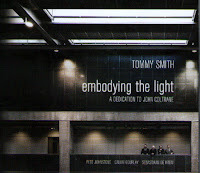 Tommy Smith (tenor); Pete Johnstone (piano); Calum Gourlay (bass); Sebastiaan de Krom (drums). 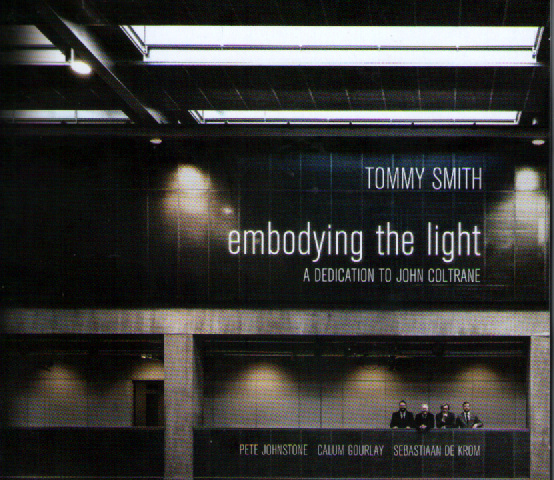 I'd become so used to thinking of Tommy Smith and the SNJO as being joined at the hip, and I use the word advisedly, that I'd almost forgotten what a formidable player he was in a small group setting. This tribute to John Coltrane puts the record straight. He is to Scottish Jazz what Robbie Burns was to Scottish Poetry. With Smith, the best laid schemes of mice and jazzmen don't gang aft agley. In fact, on this disc, they don't gang agley at all. 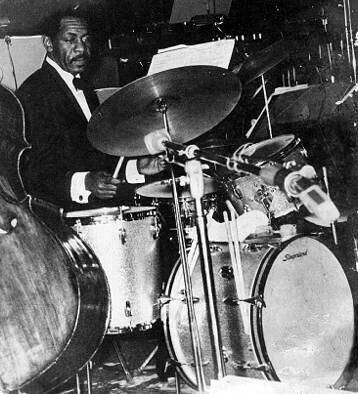 Over the 50 years since 'Trane ascended he's had many disciples but few, if any, have absorbed the complete canon as well as Scotland's own Trane. From the barnstorming Prestige/Blue Note period to the spiritual searching of the Atlantic/Impulse years Smith has it nailed. Not in a cloning manner but in a very personal way. 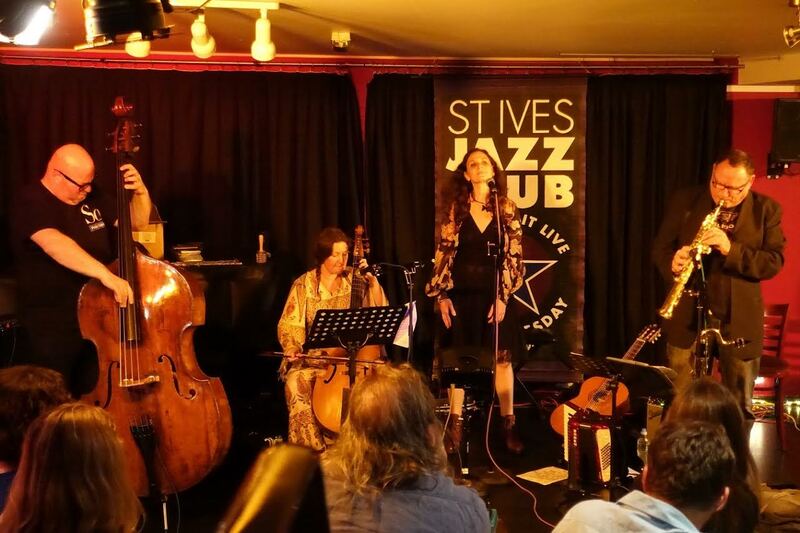 Gilad Atzmon (bass clarinet, sorprano sax, accordian and classical guitar); Tali Atzmon (vocal); Jenny Bliss Bennett (viola da gamba); Yaron Stavi (bass) + Frank Harrison (piano); Enzo Zirilli (perc). A quick reminder that tickets are still available for our summer concert on Friday 9 June at Gateshead's Caedmon Hall with our guests, Martin Litton (piano) and Nick Ward (drums), also featuring the New Century's own Caroline on vocals. Martin is an internationally renowned pianist, arranger and bandleader, who plays all the classic jazz styles with immaculate precision, and who has recorded with many of the jazz greats including Humphrey Lyttleton and Kenny Ball. Nick of course is a regular guest with the New Century, probably the country's foremost drummer in the vintage jazz style. 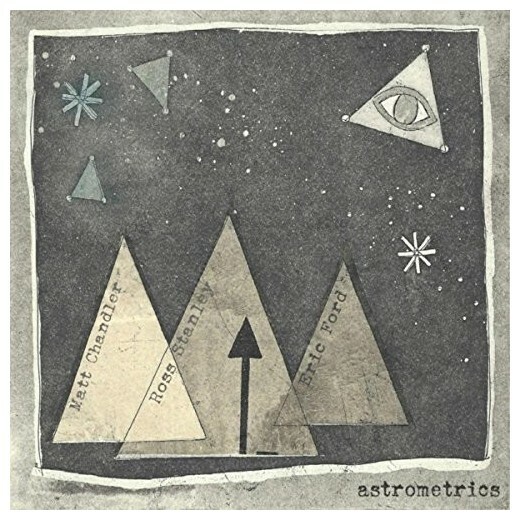 CD Review: Matt Chandler - Astrometrics. Matt Chandler (guitar); Ross Stanley (Hammond); Eric Ford (drums). Organ Trios aren't meant to be listened to in semi-suburban three up two downs. They should be heard live in downtown juke joints where the cabaret is a Saturday night knifing after somebody done somebody wrong whilst fuelled with Jack Daniels or Jim Beam. To make up for the lack of the above essentials I opened up a can of Hobgoblin ale (4.5%), made sure the knife drawer in the kitchen was locked, turned up the volume and played the album. Newcastle’s Jesmond Library reopened in November 2013 as a community-run asset in the wake of philistine political vandalism. It isn’t the same, one wouldn’t expect it to be. Volunteers trying to provide a professional service on a shoestring can’t be easy. More power to their elbow that they plough on and they’re currently in the middle of this year’s Jesmond Community Festival. Tonight members of Newcastle University Jazz Orchestra entertained local residents. 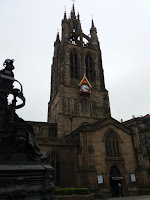 (Report by Russell & Tony Eales/Photo courtesy of Ken Drew). 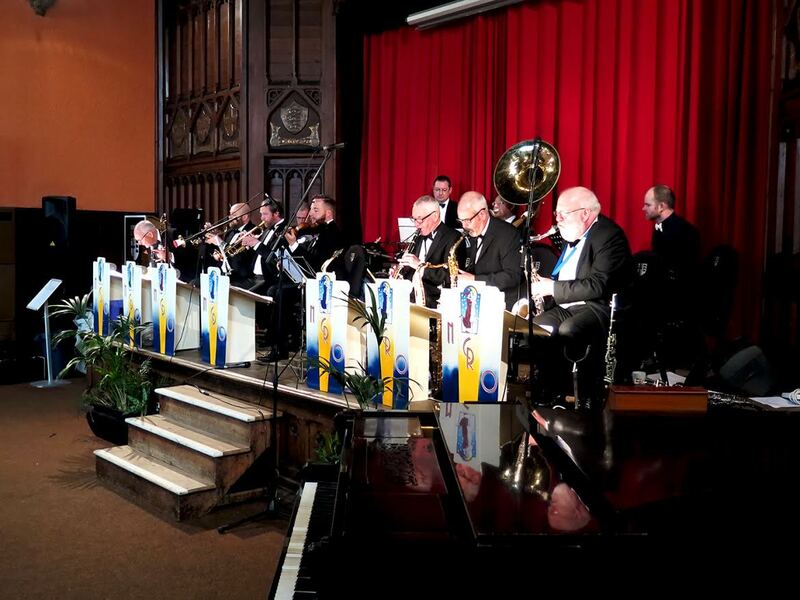 County Durham correspondent Tony Eales filed a brief report on the Strictly Smokin’ Big Band’s gig at Ushaw. A warm early summer Friday evening at Ushaw encouraged fans to turn out in numbers. The magnificent Exhibition Hall was all but sold out. Who said jazz is dead? Michael Lamb’s SSBB featured vocalist Jennifer Davies, guitarist Pawel Jedrzejewski (and other instrumentalists from the sections) and at the heart of the performance the British premiere of trumpeter Gerard Presencer’s suite written for the acclaimed Danish Radio Big Band. St Nicholas Cathedral presents performances week in week out, from the liturgical to the devil’s music…jazz! 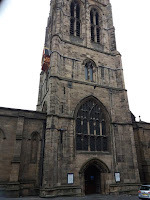 This lunchtime recital – a gig if you will – located in the south transept featured an experienced tutor and gigging musician from down the road in Leeds. 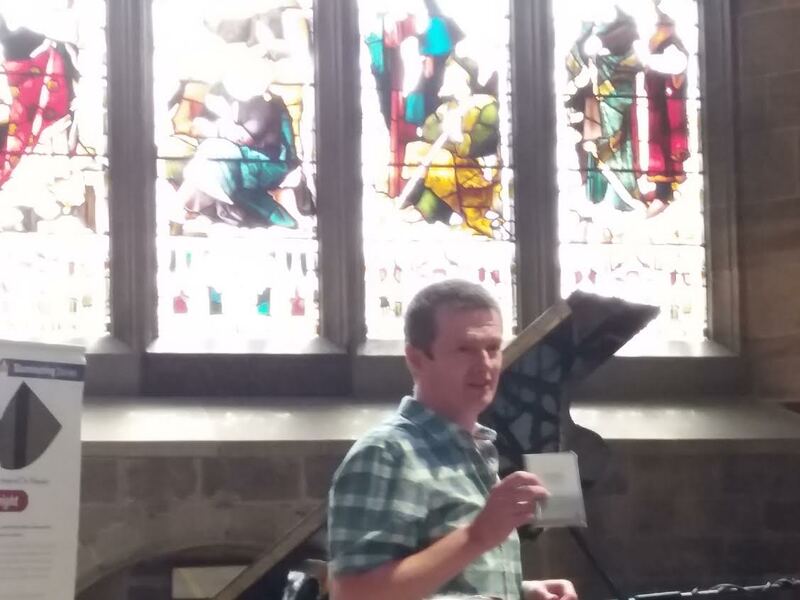 Advertised as part of the cathedral’s ‘International Recital Series’, Paul Wilkinson’s set of forty five minutes included two bona fide jazz tunes and three improvisations. On entering a sweltering Millstone Michael Lamb indicated that the pub’s upstairs room offered a cool refuge from the heat of the day, hastily adding: Only joking! Sure enough the first floor room resembled a boiler house. MD Lamb’s troops arrived in ones and twos for the Strictly Smokin’ Big Band’s monthly public rehearsal night. Several members of the band arrived in shorts. Where did they think they were? The Costa del Plonk? Strike Up the Band, Sister Sadie, Basically Blues – a typically eclectic selection from the SSBB. A noticeably absent Alice Grace (presently, the woman has more important things to attend to!) 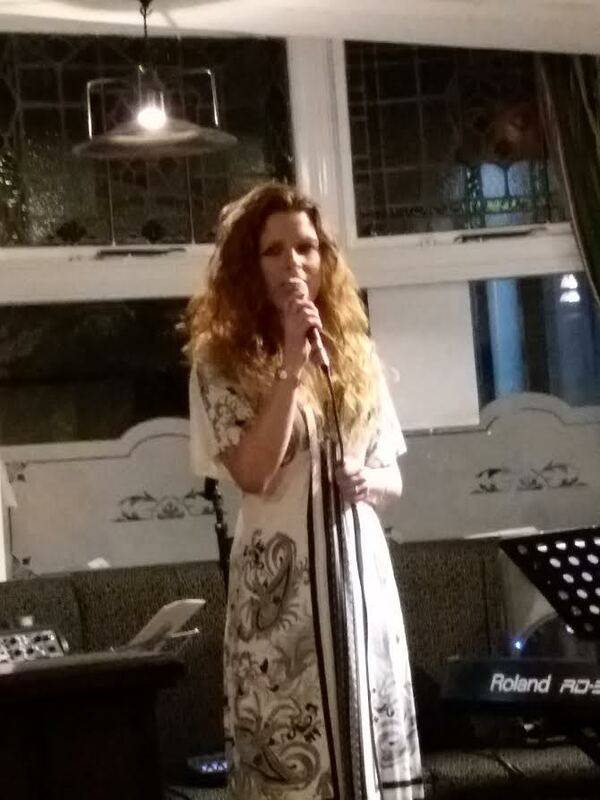 gave some present a first opportunity to hear Jennifer Davies. Orange Colored Sky (more like cloudless blue!) and Too Darn Hot (darn right!) revealed Ms Davies to be a fine singer (a more than capable dep for AG), reading the charts as in standard rehearsal mode. ... or I should say they performed in the lane (it was billed as ‘Live in the Lane’), opposite Vicolo’s coffee shop, which is next to the side entrance of the Tyneside Cinema. Not the easiest of venues, as the people drinking outside are seated in a line against the walls, not necessarily paying much attention to the music, chatting, laughing, so musicians have to make the best of it, which these two did. 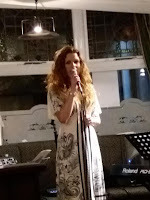 After quite a time sorting out sound problems, Lindsay struck up with a song from the great Ella, Take It Easy (?) in a pleasantly relaxed, easy, low-voiced style, followed by Dindi and the first very welcome guitar solo of the set. "Not only the grooviest band, but also the tallest" quipped Ruth as she introduced her three henchmen. She asked them to stand up and it was as if the Manhattan Skyline had taken human form with Ruth as the Statue of Liberty. A first gig for her new band but who could tell? I couldn't - they gelled from the off. No Moon at All followed by On a Clear Day told us she meant business. 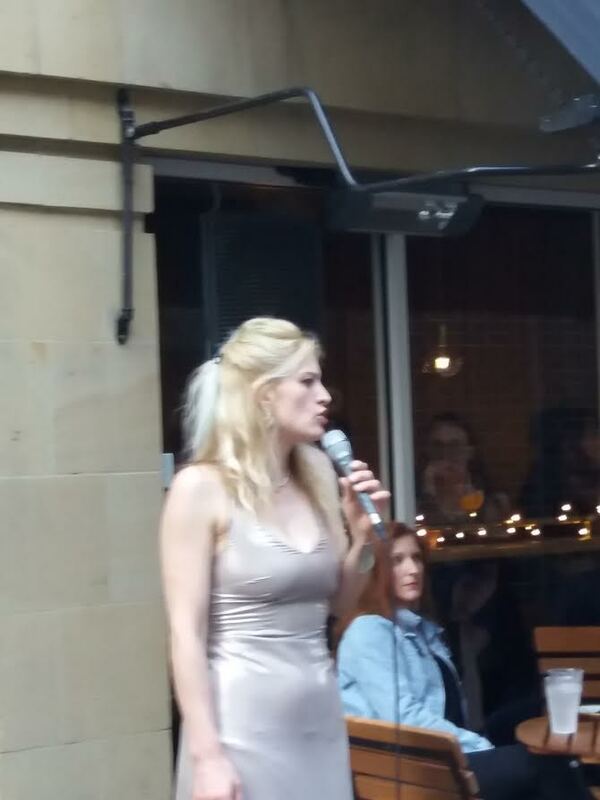 Don't think I've heard her in better voice. She had no choice, with these three guys behind her it was a case of put up or shut up. Margaret Barnes, one of the northeast's most enthusiastic supporters of jazz, sadly passed away on Thursday, May 25, after a long battle with cancer. Despite her illness, until fairly recently, Margaret continued to attend jazz concerts at various venues throughout the region. Outwardly oblivious to her failing health, she was always concerned as much about others as she was about herself. Big bands were her forte with Stan Kenton being a particular idol. We were both fans of Daryl Sherman; pictured here with Margaret at one of Mike Durham's Whitley Bay Classic Jazz Party's which Margaret attended every year. 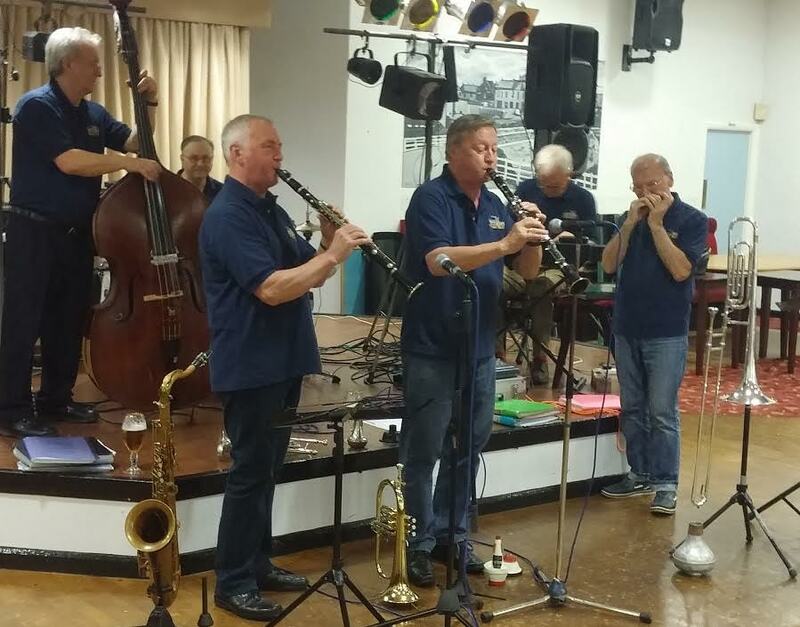 The Vieux Carré Jazzmen’s regular Thursday lunchtime session in Holystone sees the band set up at one end of the bar, the band’s regular supporters occupying front rows seats, and the seen-and-heard-it-all-before veterans sitting in the cheap seats with a pint of Deuchar’s. The Holystone pub’s lunchtime trade devours generous-sized portions of food from its busy kitchen…the jazz comes as a free-of-charge side platter. 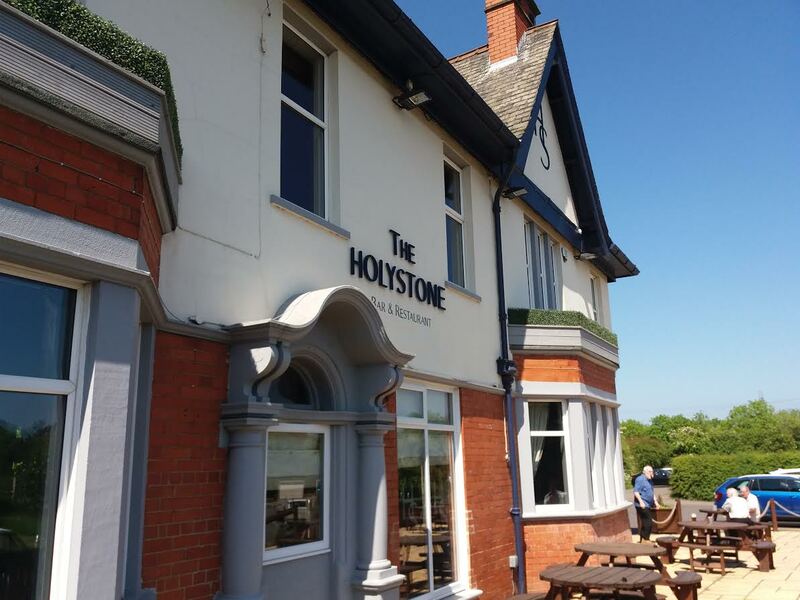 On a blue sky day a local business elected to hold a staff meeting in the Holystone’s beer garden… someone’s got to do it! 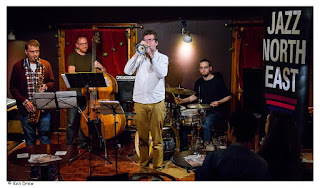 Tim Armacost (tenor/soprano); David Berkman (piano); Daiki Yasukagawa (bass); Gene Jackson (drums). Another gem from Michael Janisch's Whirlwind Recordings. And a 9 carat gem it is too! Mal Waldron's classic Soul Eyes kicks things off. Armacost is my kind of tenor player playing with a fluency that matches any of his historically better known predecessors. Chorus after chorus he soars, flying high, each one better than the one before then it's over, 'cept it isn't. Berkman takes control and the tension doesn't flag, Yasukagawa doesn't drop the baton either. Wow! And this is just the first track. 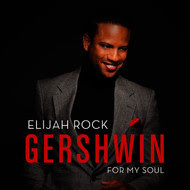 Elijah Rock (vocal); Kevin Toney (piano); John B. Williams (bass); Greg Paul (drums); Jacques Lesure/John Stone (guitar). I must confess, I didn’t know Elijah Rock from Adam Ant (biblical/music joke) and it maybe wasn’t intended for me anyway as our vocal prophet made reference to me alongside the Birmingham/London based jazz blog, the Jazz Breakfast. However, Peter Bacon was happy to pass the baton on to me and, in retrospect it may not have been the best decision he ever made – unless he’s a Cole Porter man. Think Billy Eckstine, Johnny Hartman, Cleveland Watkiss and the other rich-toned baritones that have enriched the jazz scene over the years. Elijah is on the fringe of that select group and, on the evidence of this album he’ll soon be an integral part of it. 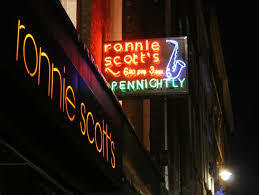 MAY's live stream at Ronnie Scott's will be the tour de force that is the Buddy Rich Big Band on Thursday 25th May at 10.15pm (GMT). Featuring legendary drummer Dave Weckl, Buddy's daughter Cathy Rich and drummer Gregg Potter plus some of the original members of the Buddy Rich Big Band. This run of 12 shows is set to be an historic week at the club, so for those who couldn't get tickets, here is your chance to watch the show - live! Ladies and gentlemen, welcome to the Village Vanguard. Tonite, all the way from Newcastle upon Tyne, England, we have a wonderful trio to play for you. 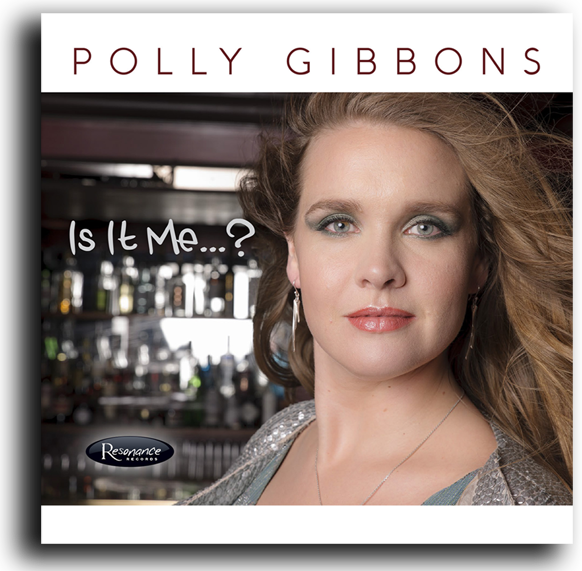 Please give a Big Apple welcome to Zoë Gilby, Paul Edis and Andy Champion! 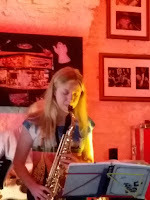 A sweltering early summer evening down in the village, the habitués of the West End Terrace monthly jazz session were hearing Zoë Gilby for the first time. It’s a long way from Zoë Gilby’s Tyneside base to the Fox Inn way out west. 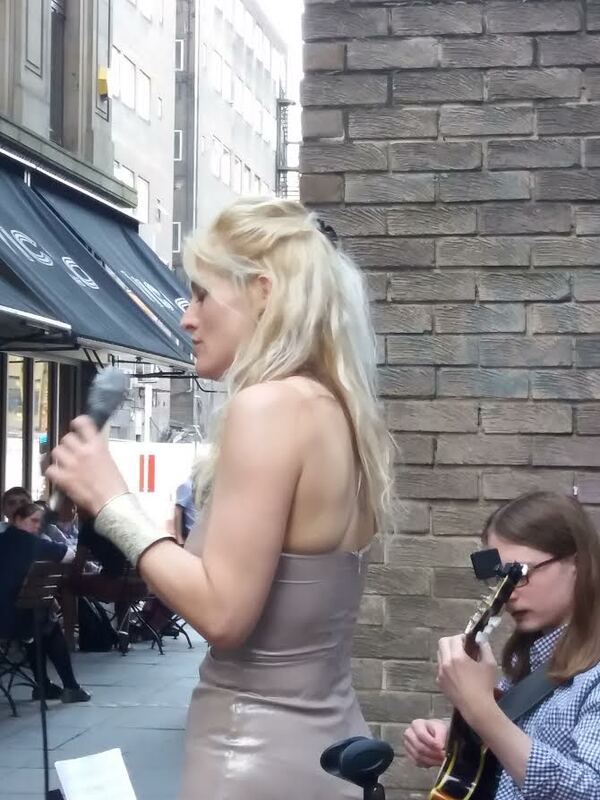 It was only a matter of time before the acclaimed vocalist would make her debut at this ace jazz club. No $10.00 minimum at the bar here! Two sets, then downtown to take the late nite subway home. It would be worth the journey. Fri 02 DJ set @ Fowler’s Yard, Back Silver Street, Durham DH1. 6:00pm. DJ Andrei Sandu. 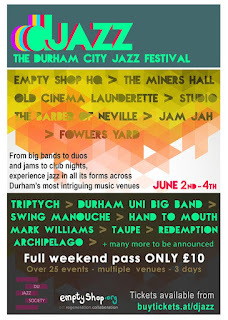 Fowler’s Yard is the DJ Durham Jazz Festival Main Stage & Festival Hub. Hill Island Brewery (located in Fowler’s Yard) is hosting a mini beer festival. Fri 02 Elvet Quintet @ Fowler’s Yard. 7:00pm. £10.00. weekend ticket, £3.00. on the door. holder will be given priority admission over an on the day single gig ticket purchaser. Senza Frame (7:00pm), Taupe (8:00pm), Archipelago (9:00pm). £10.00. (weekend), £3.00.on the door. Fri 02 DJazz Jam Night 1 @ Empty Shop, Durham. 10:00pm-1:00am. Sat 03 Nintai @ Fowler’s Yard. 1:00pm. 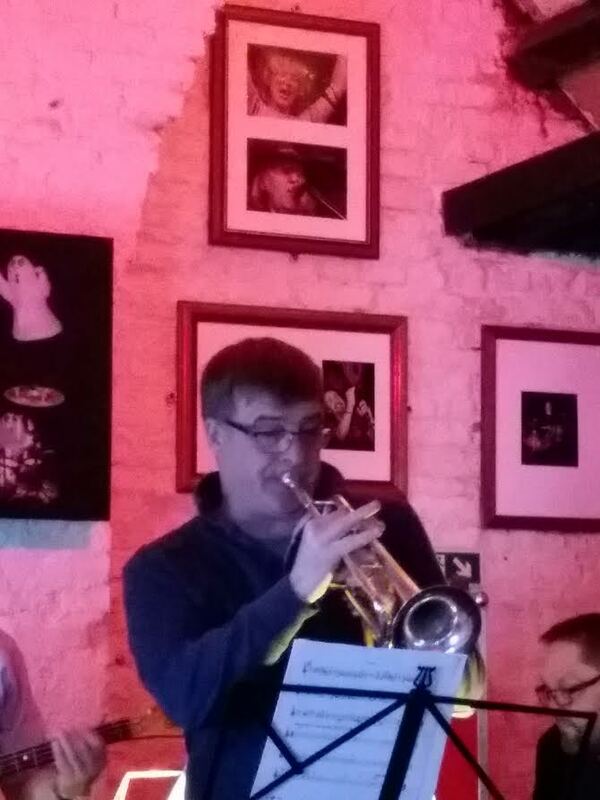 Sat 03 Jazz Jam @ Fowler’s Yard. 6:00pm. Common Spaces opens with the angular Groovy. 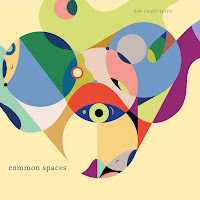 A rhythmic pulse surges through Antonio Fusco’s composition with Bruno Heinen’s robust piano playing and the composer’s commanding drumming suggesting that this New Simplicity Trio album is going to be a swinging, hard driving affair. Making assumptions about what will follow should be resisted for fear of being proved wrong! A further nine tracks - three from Fusco, four from Heinen, one from bassist Henrik Jensen and one standard - go on to disprove any such notion. Mickey Roker died yesterday (May 22). A drum legend, often cited by Dizzy Gillespie as his all-time favourite, recorded and toured with many of the hardbop stars of the 1950s onwards including Duke Pearson, Herbie Hancock, Lee Morgan and many others including Sonny Rollins. As I type I'm listening to Sonny Rollins on Impulse! where Roker spurs the tenorist on on the up tempo numbers and provides a cushion on the ballads. Sadly, I never got to hear him live. 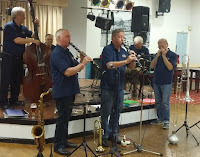 It reminded me of a night in the 1980’s when I’d gone to Seaton Terrace Club in Seaton Delaval to hear Humphrey Lyttleton’s band with South Shields born Kathy Stobart on reeds. (The crap support act was a guy who was a star from New Faces who did impressions of aircraft taking off by blowing into the mic.) It was at this gig that Humph and Kathy did the two clarinet thing, which I thought was a one off and I’ve never seen it done again. me up. The singer and guitarist usually work together as a duo, and they’d just had an hour or so with Paul before the gig. Ms Moreno said she had a frog in her throat, (didn’t show), but none of this hindered the band from giving us a thoroughly enjoyable evening, which was also part of the Late Show events. 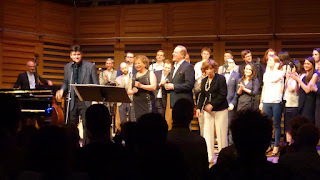 The room was swarming with family, friends and admirers, but most of all, singers on Sunday night in the acoustically perfect Hall 1 at London’s Kings Place. Yes, there were more singers than you could shake a tuning fork at. And it seemed as if they all personally knew choirmaster extraordinaire Pete Churchill and his wife Nikki Iles, or had at the very least participated in a vocal workshop at some time with the dynamic, charismatic Churchill. It was, in short, a musical love-fest. The pianist, composer and arranger has been immersed for seven years in rendering the Gil Evans/Miles Davis Miles Ahead album into vocalese, and performing it with the 23-strong London Vocal Project. In order to achieve this Churchill has crossed the Atlantic a number of times to collaborate with the legend that is Jon Hendricks, helping to add the great man’s lyrics to the themes and solos on that epoch-busting album. Way back in 1957, Hendricks, Dave Lambert and Annie Ross prepared the ground with their Sing a Song of Basie album, an early exercise in multi-tracking, on which all Basie’s instrumental parts were sung rather than played. 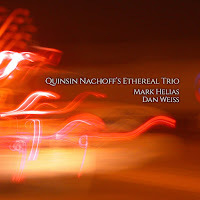 VEIN’s new album traverses the history of the jazz piano trio from Bill Evans to the present with a nonchalance that is the preserve of the supremely gifted. 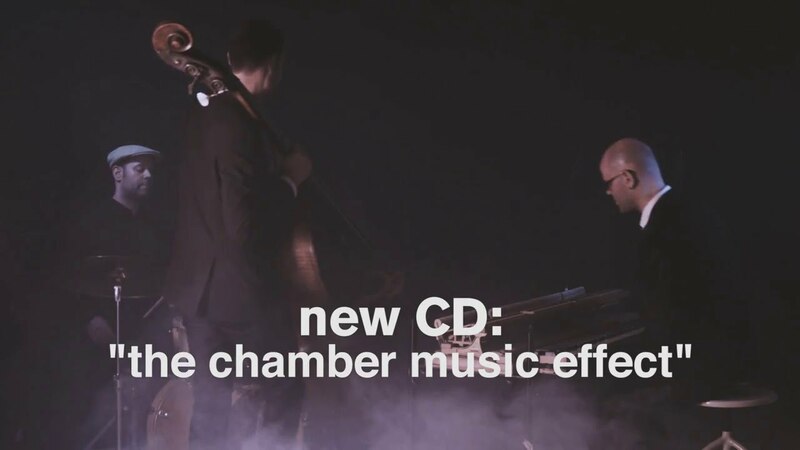 An all-original album of eight tracks with writing credits shared between the musicians (primarily the Arbenz brothers) The Chamber Music Effect pays homage to the jazz piano trio format and seeks to explore and extend possibilities as jazz moves into its second century. You can hang your pork pie hat on some bands - Alter Ego is one of them. 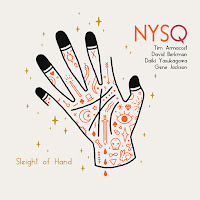 An accomplished sextet with a pad of original compositions and smart arrangements of classic material, Alter Ego play gigs for the fun of it with a commendable no nonsense approach. Alto saxophonist Keith Robinson pulls together a set list confident that his band mates will be up to the job with some of them contributing one or two charts which proudly take their place alongside tried and tested numbers. 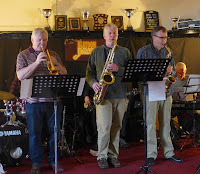 This Blaydon Jazz Club date found the sextet in fine form. Mark Hanslip (tenor sax); Graham South (trumpet); Seth Bennett (bass); Johnny Hunter (drums). Friday night at the Caff with a co-promotion by Jazz North East & the Jazz Cafe - what to expect? Playing all original material by master percussionist Johnny Hunter was something to look forward to, particularly following the reviews from last year’s Manchester Jazz Festival. Although some regular faces were absent the audience numbers were swelled by many new ones – great to see! All tunes felt quite accessible through their interesting compositions and delivery by the band. What a tight band (when needed), interspersed with much free playing, yet always collectively in sync. Most tunes had extended solos from 2 or 3 of the band each time, giving the opportunity to freely develop some space around each tune. I was surprised but pleased to see an extended drum solo in the second piece which provided a perfectly formed segue into the third. There were many fine solos yet no immediate applause for them. Thankfully the applause at the end of each set showed the true measure of the audience's appreciation, bringing smiles of delight to the band. Sorry Daryl, maybe next year! Still, in the meantime, a lot of CDs to listen to. Have a great gig. 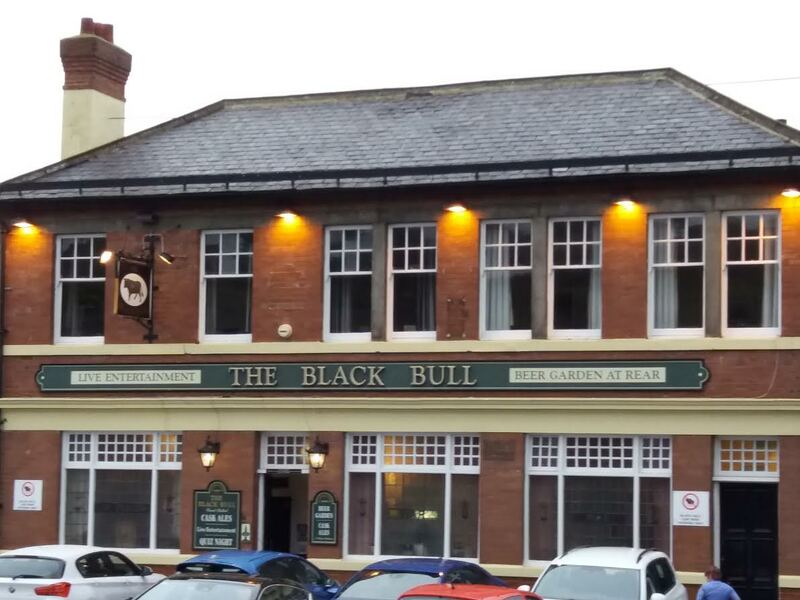 The spirit of the Jazz Messengers will descent on the Black Bull, Blaydon tomorrow night (May 21). 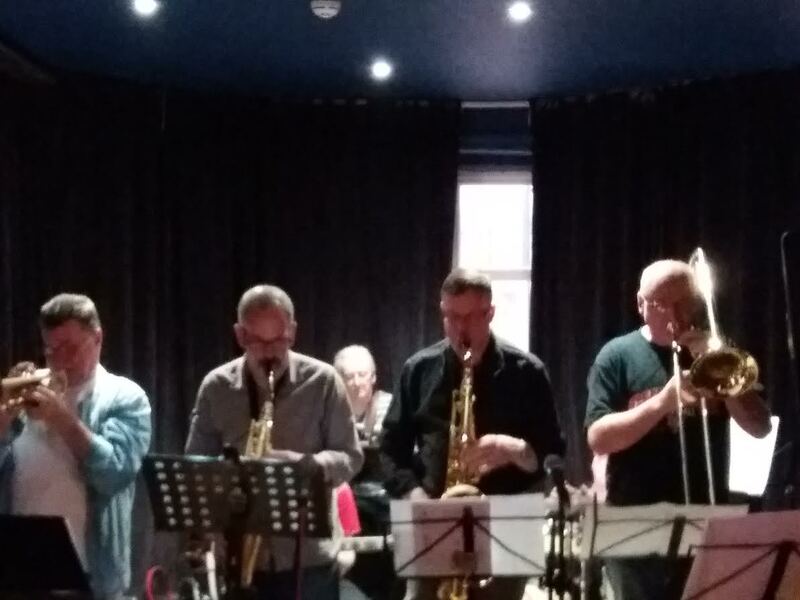 Blaydon Jazz Club will welcome the return of bop heroes Alter Ego on Sunday evening and it could well be a full house. The best advice is to arrive early to secure a seat. The first set starts at eight o’clock, seats will be snapped up by about seven thirty, so, make the effort to get along in good time. 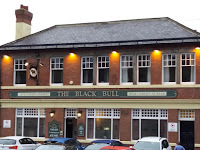 It is a pay on the door gig – a mere fiver – and the Black Bull pub on Bridge Street offers a well-kept pint for the discerning imbiber. On street parking is available adjacent to and opposite the pub, and the nearby Blaydon bus station provides reliable quick links to Newcastle, Gateshead, and west to the Tyne valley. You say your kind of jazz is swing or Dixieland, perhaps the GASbook. Be a devil, let your Alter Ego take you to bop paradise…Sunday 21 May, Black Bull, Blaydon, eight o’clock sharp. 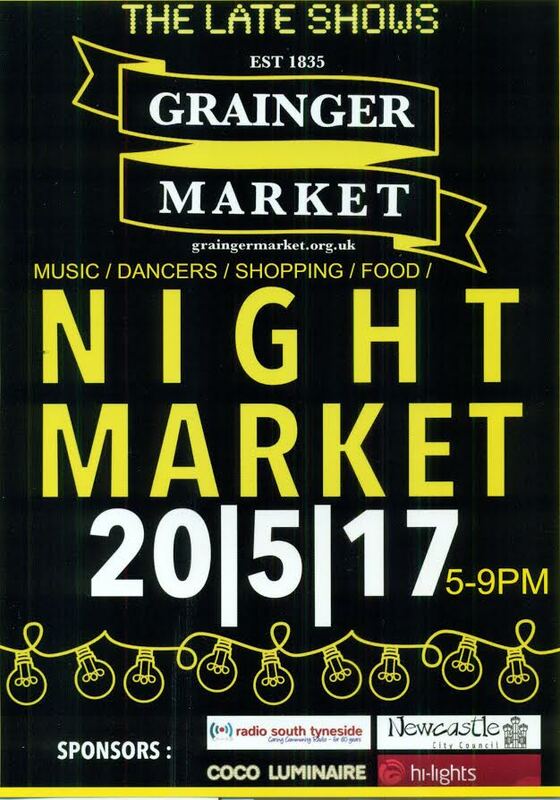 If last year’s Grainger Market Late Shows is anything to go by this year’s event promises to be breaking at its Victorian seams. Every alley was crowded with Late Show attendees shopping, eating pizzas and drinking coffee. Some listened to musicians performing on temporary stages dotted around the Grade I Listed building. This year’s line-up includes Brent and the Brads on Stage 1 playing two sets: 5:30-6:00 and again at 7:00-7:30. Jazz Riot (don’t worry they're not dangerous!) 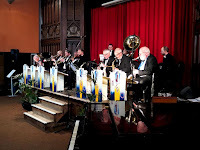 hold court at 7:45 for half an hour, and over on Stage 2 from 6:30-8:00 there is Lindy Jazz Swing Music. 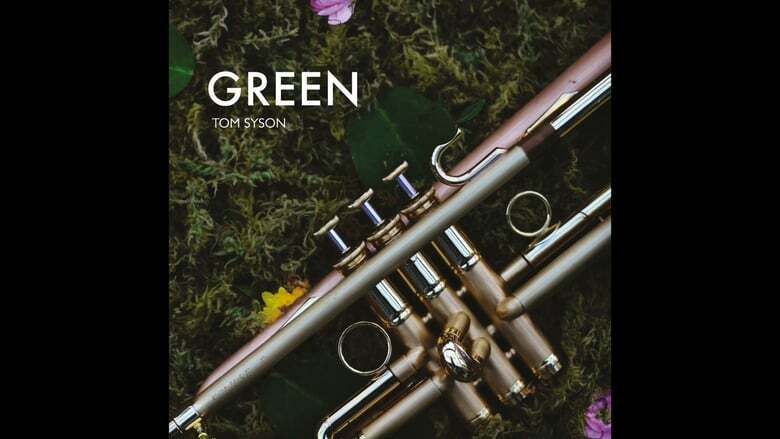 CD Review: Tom Syson Sextet - Green. 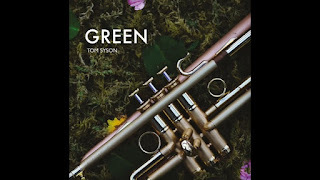 Tom Syson (trumpet); Vittorio Mura (tenor); Ben Lee (guitar); David Ferris (piano); Pete Hutchison (bass); Jonathan Silk (drums) + Lauren Kinsella (vocal on 1 track). Syson is quite an amazing young trumpet player. A product of the Birmingham Conservatoroire that is currently rolling them out by the dozen, Syson must surely be listed in the 'Most Likely to Succeed' category. 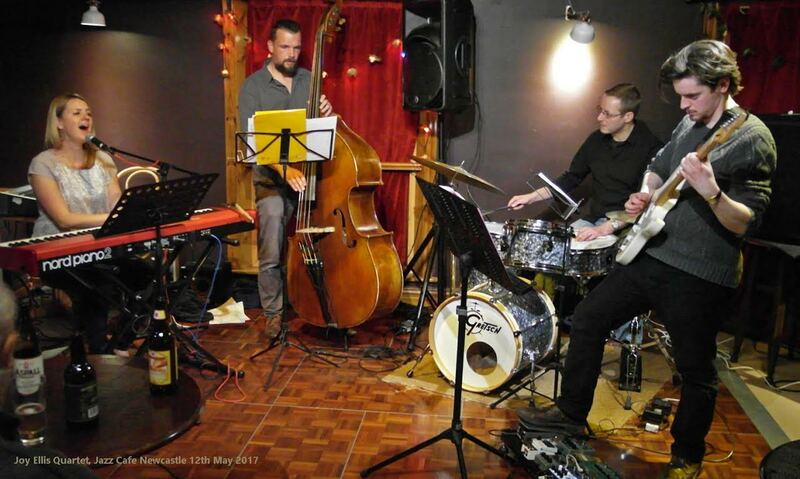 The welcome return of Dean Stockdale to the Lit & Phil, on this occasion working with the west of the Pennines bass and drums pairing of Gavin Barras and Adam Dawson, presented a first opportunity for Newcastle gig-goers to purchase the pianist's new CD. What's more, this Friday lunchtime concert was recorded for, at the very least, posterity, if not future release. Adam Dawson's last minute arrival via the always busy M6 and the recording engineer requiring a few minutes to mic-up the kit resulted in the usual one o'clock start being delayed slightly. The published programme of eight numbers actually ended up with nine tunes being played - more of that later. Frankly Sinatra - Stephen Triffitt @ Sage Gateshead, May 18. Level One of Sage One was 99% full. The faithful had turned out to pay tribute to the late legend as seen through the eyes and voice of the generally acknowledged next best thing. He looks like Old Blue Eyes, moves like him and, most importantly, sounds like him. At times it was uncanny such was the resemblance. It wasn't the hippest of audiences, even though I'd warrant that a fair percentage of them had had hip replacements in recent years, and many of the Sinatra style quips went over their heads. Nevertheless, one and all seemed to enjoy the music with the big winners being New York New York and Strangers in the Night, oh yes and, natch. My Way. A choice selection of gassers included Come Fly with me; I've Got the World on a String; Pennies From Heaven; Please be Kind; The Summer Wind; Tender Trap; Witchcraft; Way You Look Tonight; Night and Day and New York New York. This brought the first set to a close - time for a Jack Daniels. Michael Lamb's Strictly Smokin' Big Band are excited to make their first appearance at Ushaw College as part of Paul Edis' programme of jazz events featuring guest vocalist Jennifer Davies; alongside the band's renowned line up of soloists including Keith Robinson (Alter Ego), Dave Kerridge, Jamie Toms (Not Now Charlie), Paul Gowland, Sue Ferris, Pete Tanton (Riviera Quartet), Kieran Parnaby, Graham Don and Pawel Jedrzejewski. 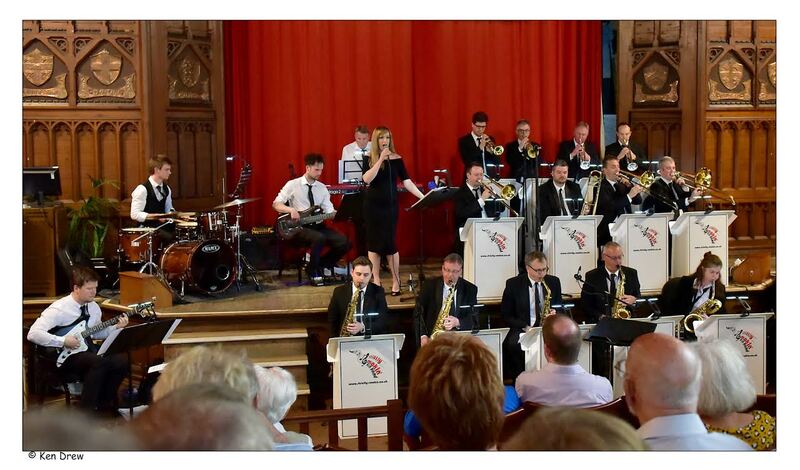 The audience can look forward to a heady mix of expertly performed big band jazz, including the UK premiere of music written by international trumpeter Gerard Presencer for the Dutch Radio Big Band's recent collaboration with Rolling Stones’ drummer Charlie Watts. Take it to the Bridge is an institution. Dave Weisser’s weekly ‘workshop’ has been going since the year dot. From time to time the institution’s leader invites a band to come along and play a set. This week’s guests were fulfilling a twice postponed appearance at the Jazz Co-op’s Globe HQ. Lickety Split is a no nonsense band. Turn up, play, job done. Band charts depleted due to a thief’s keen ear for something of real value – yes, stolen notes of the musical kind, of much greater value than a swag bag full of five pound notes – didn’t deter Eddie Bellis’ outfit. Minus the band’s absent pianist, Bellis and co were ready for Lift Off! Exhilarating, drilled brass and reeds, an object lesson in dynamics, the ideal calling card. Early Nite are a Manchester based trio who performed a thoroughly entertaining set at The Bridge on Sunday night. 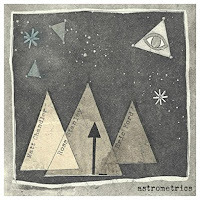 Their music is highly frenetic and full of good humour. Think ‘Flight of the bumble bee’ meets Ornette Coleman. The band certainly seemed to be enjoying themselves and their bonhomie translated itself to the audience. 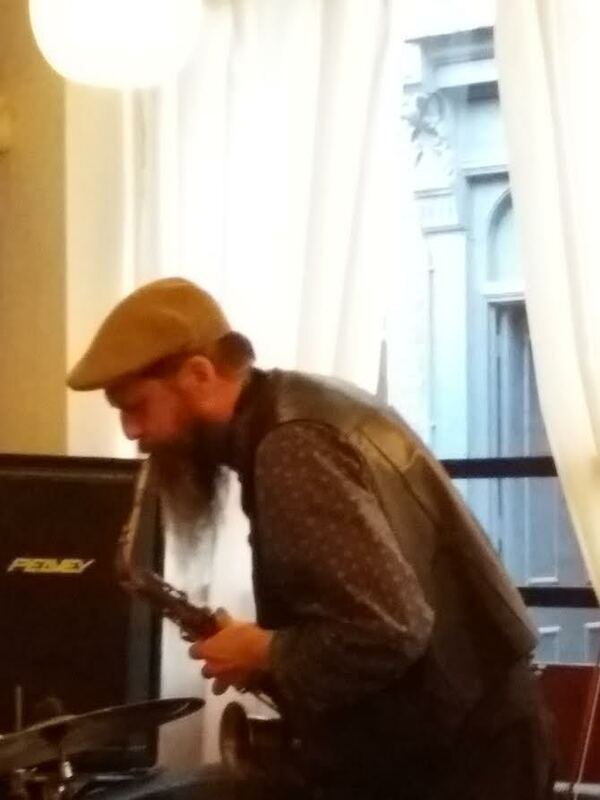 Saxophonist Harry Smith was virtually jumping around the stage as he performed whilst Otto Wilberg on bass was both innovative and great to watch, at one point using his bow as a plectrum. Not to be outdone drummer, Alexander Tod, was excellent on drums incorporating various percussive additions to the normal kit to great effect. The superlatives have been exhausted. A regional jam session can’t be this good. People would pay good money to hear Mark Williams, Paul Grainger and Rob Walker. The trio played three or four numbers before guitarist Williams and drummer Rob Walker stood down to allow an endless parade of first rate musicians to sit in. A piano player just turned seventeen, a drummer eighteen, joined by a twenty-ish trumpet-playing university science undergraduate, an early twenties guitar virtuoso…who needs Messrs Williams and Walker? Rumour has it they went for a curry. 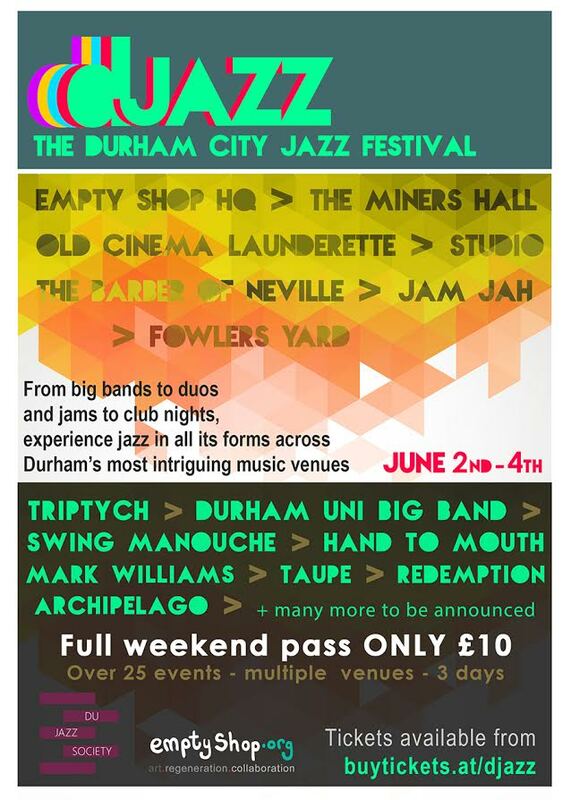 A new festival in Durham will bring together the region’s best jazz musicians with the city’s most intriguing music venues. From big bands to duos and jam sessions to club nights the festival is a chance to experience jazz in all its forms – in a host of unique settings. 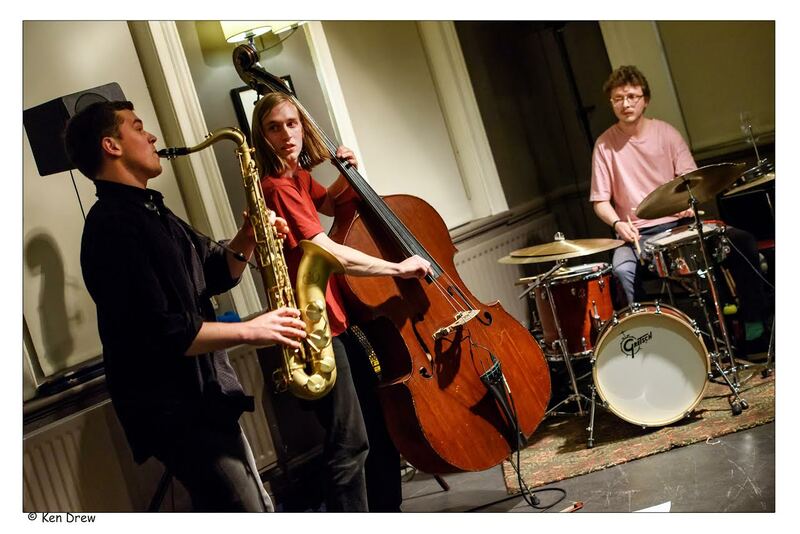 Empty Shop CIC and Durham University Jazz Society have teamed up to put together this eclectic weekend which celebrates the fact that Durham is a city falling ever-more in love with the sounds of jazz! Featuring more than 25 events taking place across seven different venues the festival has something for everyone and in its first year a weekend ticket is just £10! 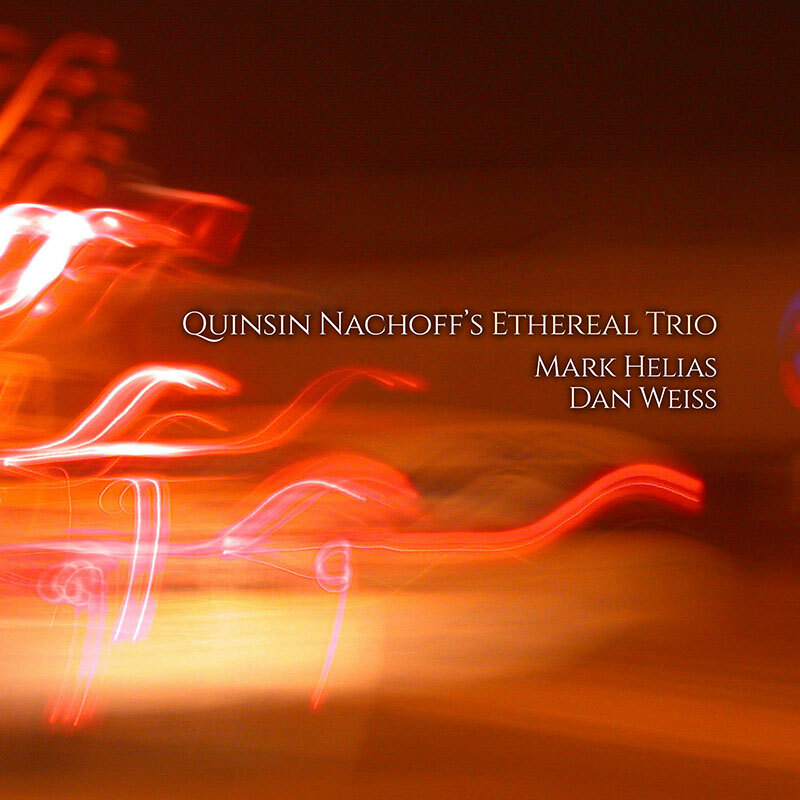 Quinsin Nachoff (tenor); Mark Helias (bass); Dan Weiss (drums). 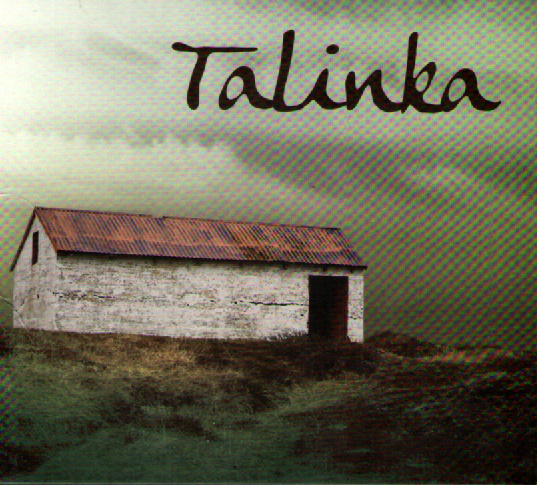 The releases from Whirlwind Recordings continue apace from either side of the Atlantic. 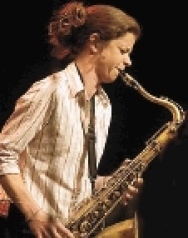 The latest one to arrive at the BSH Head Office overlooking the Tyne and Wear Metro Line features New York based, Canadian born, saxophonist Quinsin Nachoff and is well worth checking out. I wasn't too sure as to how ethereal the trio actual was so I took the easy way out and Googled 'ethereal synonyms'. Airy, Celestial, Exquisite, Ghostly, Intangible and Sublime were the top answers and the trio ticked all the boxes. Not all the boxes on every track but, over the course of the six pieces, managed to touch down on at least one and occasionally all. Blues for Duane, One Mint Julep, Bernie’s Tune, three gems for starters. 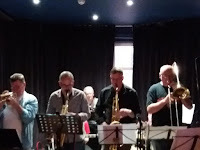 The Jazztones returned to play another set at the Quakerhouse, the de facto HQ of the long-running Darlington Jazz Club. The Mechanics’ Yard pub hosts regular gigs – blues, rock, and, twice a month, jazz. A six o’clock start attracts listeners and performers across the age spectrum – teenagers to octogenarians. 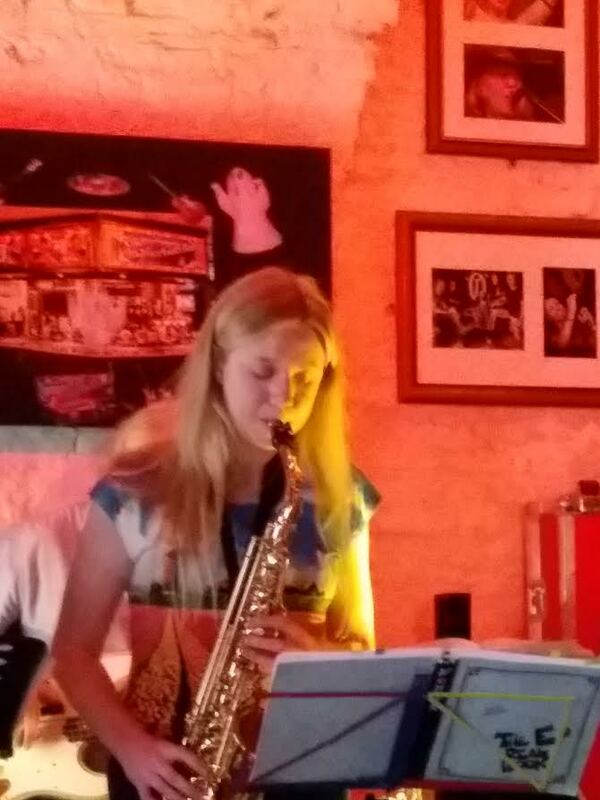 An illustration of this early evening gig policy presented an established small group (the Jazztones) a been-there-done-that musician invited to sit in (pianist Mr Ted Pearce), and star of the future, Ms Beth Roberts playing alto saxophone. The 2017 Jesmond Community Festival includes a couple of student jazz offerings. Later in the month members of Newcastle University Jazz Orchestra return to play a set ranging from swing era standards to bop and beyond. 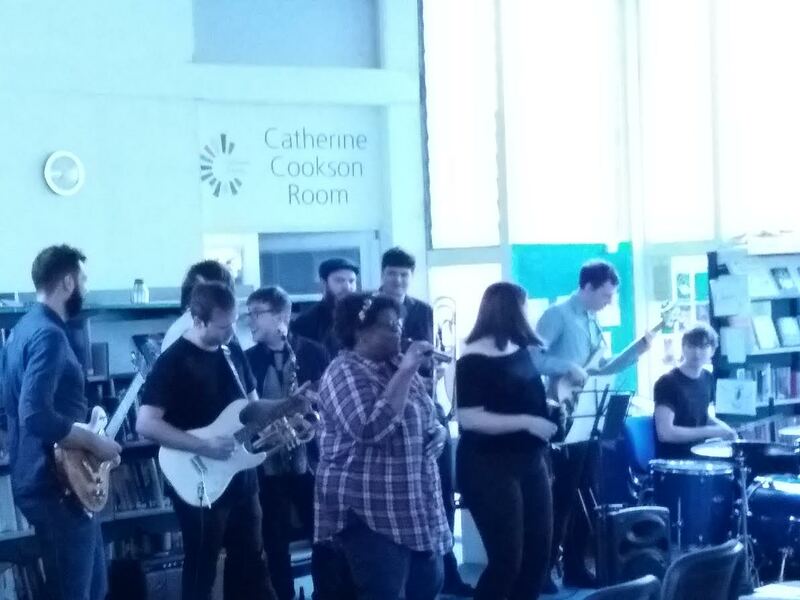 Last night’s jazz concert in Jesmond Library presented a new outfit – new to BSH that is – playing a funk set. 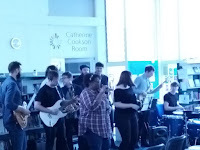 Philonious Funk is a student band from Northumbria University. 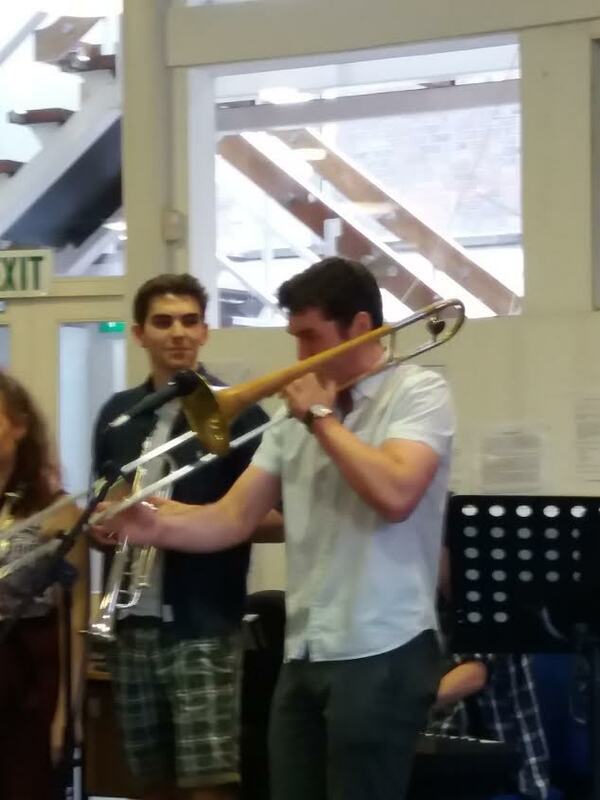 The former polytechnic doesn’t offer a music degree but what it does have is a group of students playing music for fun and this public performance of two short sets of funk and soul entertained festival-goers in leafy Jesmond on a mild Saturday evening. County Durham correspondent Tony Eales has filed a brief report to inform BSH readers that Sue Ferris played a storming gig at last night’s Opus 4 Jazz Club gig at the Traveller’s Rest. The West Auckland Road pub’s upstairs room was well populated as Ferris blew some tremendous tenor (a first set played on a borrowed tenor from the well known reeds man Paul Edis). Ferris made a call to Noel Dennis who readily accepted a dep gig for the otherwise engaged Graham Hardy. Not too shabby a replacement! Paul Smith took the drum chair, Neil Harland, bass and Dr Edis assumed a familiar role – that of pianist, his day job! Second set, having made running repairs, Ferris played her trusty tenor. 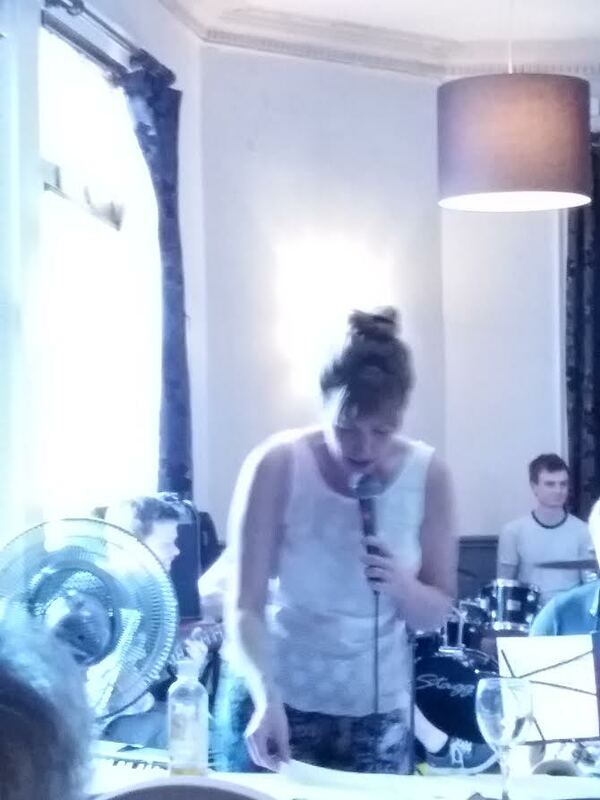 All in all, another highly successful Darlington jazz gig. 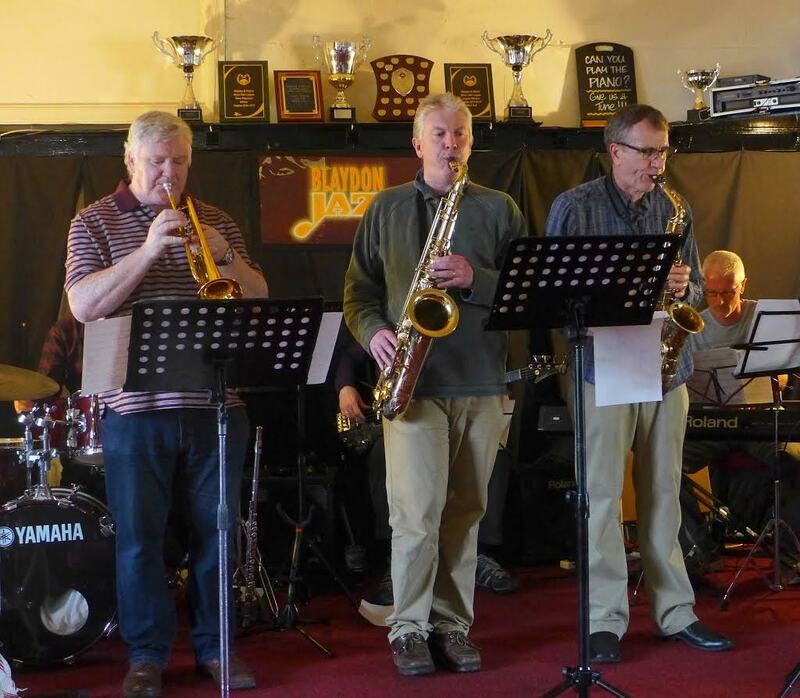 Today (Sunday) at six o’clock Darlington Jazz Club meets in the Quakerhouse with the house band – the Jazztones – playing a few tunes. Recommended. 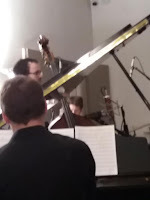 Ben Lawrence (piano); Alex Shipsey (bass); Dylan Thompson (drums). Paul Edis kindly sent me these three videos recorded by BLT yesterday afternoon. The musicians, average age 15, are students studying at Sage Gateshead with CAT/Jambone. An afternoon productively well-spent I would say! This Newcastle Jazz Café date previewing her forthcoming CD Life on Land was a first opportunity for a Tyneside jazz audience to hear singer-songwriter pianist Joy Ellis. The London-based Ellis is fortunate in being able to work with many of the best musicians on the scene. 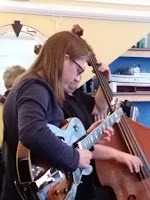 Three of them made the journey north to perform two sets of Ellis’ compositions, some of which feature on her new CD, some yet to have a title. A select gathering on Pink Lane thoroughly enjoyed listening to Ellis and her band – James Kitchman, guitar, Henrik Jensen, double bass, and drummer Adam Osmianski. 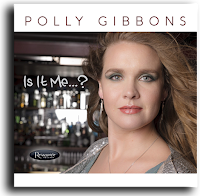 Polly Gibbons (vocals); Tamir Henderson (piano/arr. 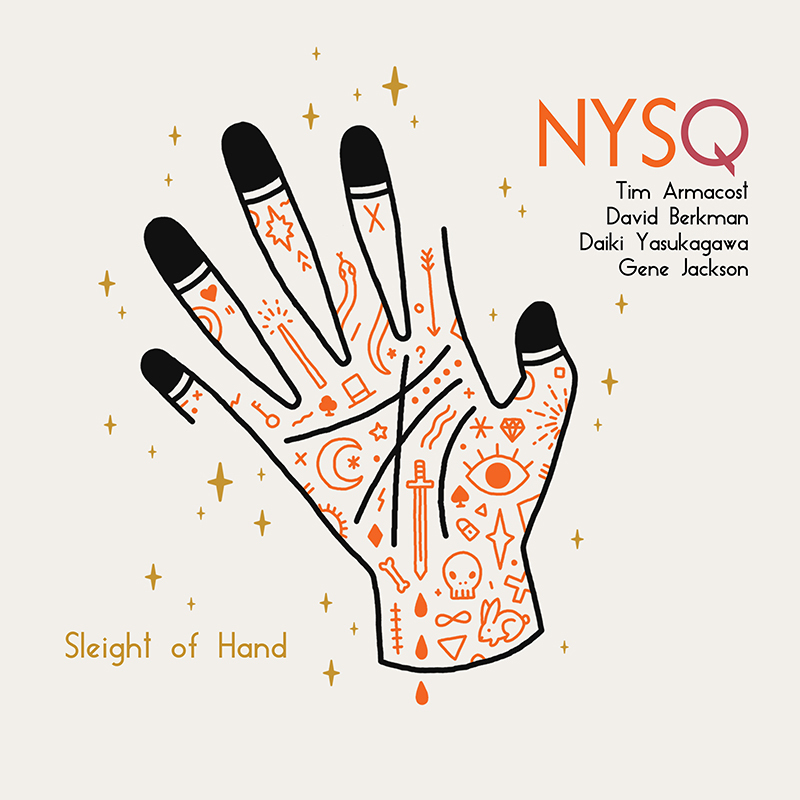 ); James Pearson (piano/arr); Shedrick Mitchell (B3); Graham Dechter (guitar); Kevin Axt (bass); Ray Brinker (drums); Willie Murillo, Vinny Dawson (trumpets); Bob McChesney, Andy Martin (trombones); Bob Sheppard, Brian Scanlon, Keith Bishop, Tom Peterson (reeds). Steve T suggests that all jazz singers should listen to some soul. Well, I don't know if Steve and Polly are acquainted but the latter is one lady who most certainly has, albeit not to the exclusion of other related genres. Before I'd read the notes my reaction upon hearing several of the tracks was Gladys Knight. Lo and behold, it turns out Gibbons was the support on the 2016 UK tour by Knight and George Benson. On I Let a Song Go Out of my Heart the influence is Ella but, whether it be Gladys or Ella there's also a whole lot of Polly in there which doesn't mean she does it parrot fashion. This Friday lunchtime performance, one in a regular recital programme at St Nicholas Cathedral, featured Paul Taylor in a set of forty minutes or so playing solo piano improvisations. 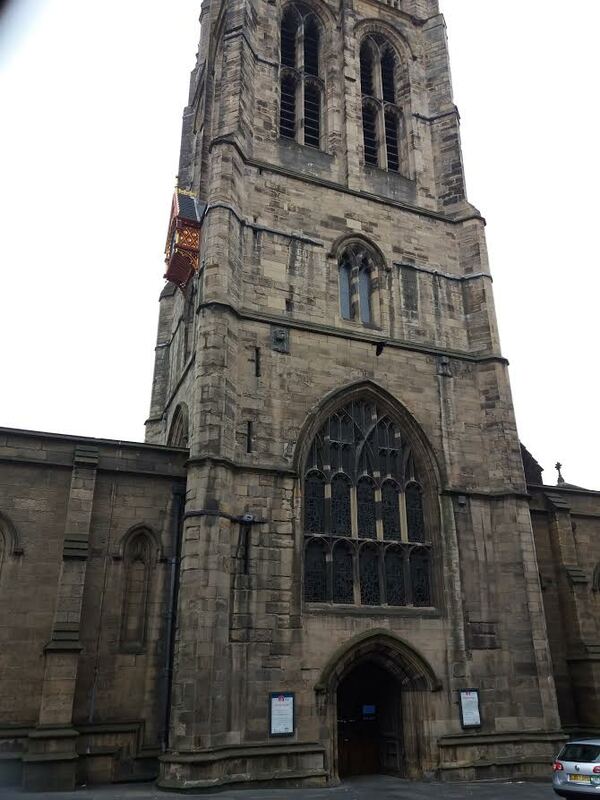 The recital programme presents artists from far and wide (an organist, a classical guitarist, a soprano voice perhaps), today a musician based in the region expressed his delight at being offered a platform within such imposing surroundings. 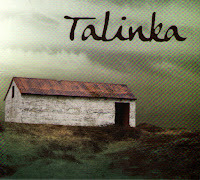 Paul Taylor specialises in solo piano improvisations. Elegant, impressionistic, cascading lines, a confluence of ideas, Taylor seemingly abandoning a line of thought in favour of another before a return to an earlier statement. The audience listened, some with closed eyes, contemplating who knows what? Taylor is a quietly spoken man, his introductory remarks audible to those seated in the pews nearest to the piano situated in the nave. Other audience members sitting several rows behind struggled to hear, but no matter, Taylor’s music spoke for him. At the conclusion of his set Taylor stood up, acknowledged the audience, and walked off with a backward glance at the piano. A concert performance of quiet, reflective piano playing. Look! The Broken Doll! 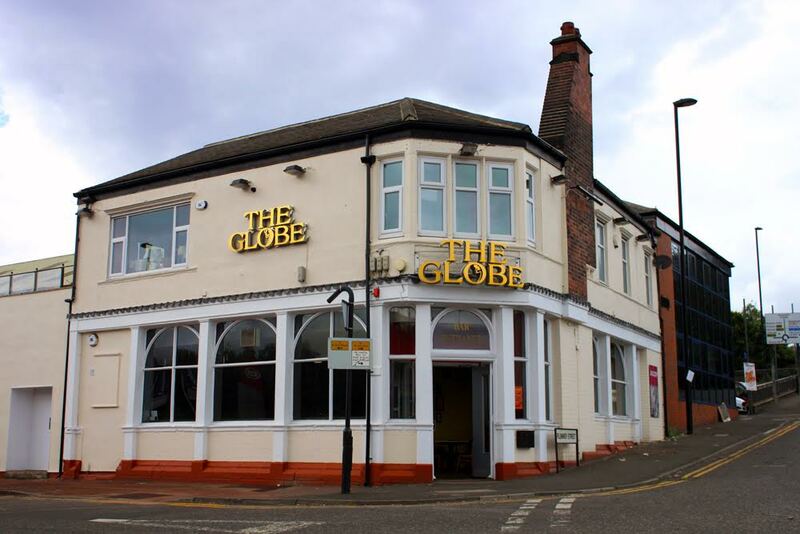 The Globe! Jazz Café Jam Session - May 2.